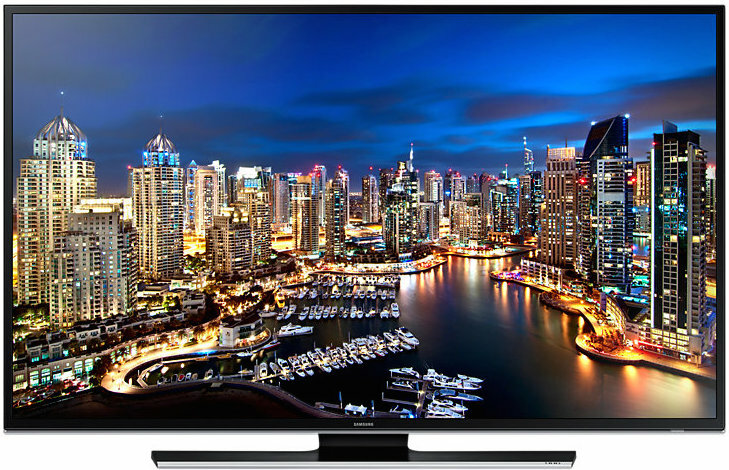 What is HDR, and should I get a HDR TV? TV shopping has always been tricky, with endless new terms and features such as today’s buzzwords of HDR TV and 4K UHD TV. We’re at the turning point where 4K TVs are coming down in price and becoming a viable option for everyone. To catch you up, 4K TVs provide more pixels and deeper colour palette for a more detailed picture. Mixed in with 4K TVs is the term HDR, and it offers a further improvement in picture quality. HDR, or High Dynamic Range, offers more brightness or ‘luminance’ levels in pictures – you get more details in dark sections as well as light sections. High-end smartphones accomplish this by taking multiple pictures and then combining them into a more detailed picture. This way detail isn’t lost in shadows or washed out in bright areas. HDR is the similar in video. Manufactures are starting to make HDR TV sets available with more dynamic range in the brightness, e.g. 10 times the luminance levels. This brightness range isn’t meant to be just bright, but more importantly, be better at displaying increments of brightness from deep black to bright white. This should translate into a more realistic, natural picture. For example an outdoor scene with HDR should allow us to see more detail in the shadows below a tree as well as the texture of clouds. With current HDTVs, this would basically be just darkness under the tree and uniformly white clouds. HDR TV often gets mentioned along with 4K TVs, but it doesn’t necessarily need a 4K TV. Although 4K TVs offer more pixels and expanded colour palette, a HDTV would also benefit by having more brightness or luminance levels. Like most things, the higher end gets fancy new features first, and 4K TVs are the higher end right now. HDR could trickle down to HDTVs, but its unlikely as dropping prices and prevalence of 4K TVs will make this a moot point. HDR is a new technology and the standard is still being figured out, but good sets will apply processing to regular video to make it HDR-like. Streaming services like Netflix are working to provide HDR content, and HDR TVs should also be software upgradable when standards do get set. Hopefully you understand HDR a bit more now, but the real question you may have is if its worth it paying for. If you have the budget for a new 4K TV, then the quick answer is yes. More and more decent, mid-level 4K TVs have some form of HDR, while the high-end models also include better processors to help regular video look better. With the weather warming, its fitting to review options for landscaping and outdoor speaker wiring. A outdoor speaker system can compliment your outdoor living and entertaining. 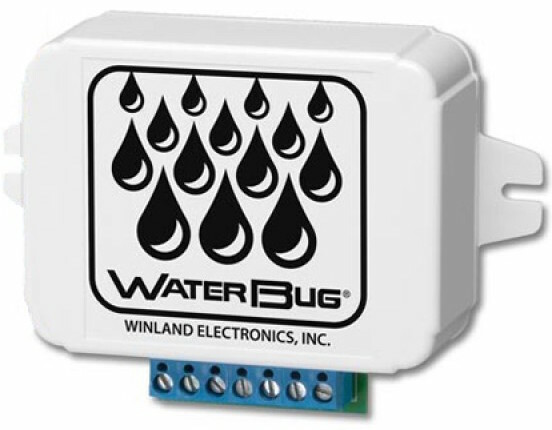 There are two types of systems that are available: conventional and 70 volt systems. The one that is right for you depends on your outdoor plan. 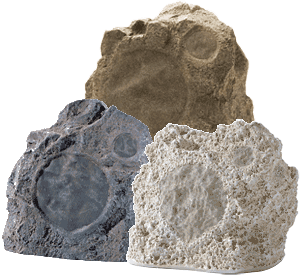 You might be familiar with conventional systems, as this is what is used in most homes. Conventional speakers and amplifiers are rated at different impedances, so take care that the speaker load (or impedance) is matched to the amplifier. If its implemented wrong, the amplifier can be overloaded and damaged. Often amplifiers will allow a range, e.g. 4-8 ohms, so you can use one set or two sets of speakers wired in parallel with no issues (wiring two 8 ohm speakers in parallel make them look like 4 ohms to an amplifier). Otherwise you’ll need to use multiple amplifiers. Amplifiers will specify rated wattage for each impedance, e.g. 50W at 8 ohms. For long speaker wires, like the ones used in large yards, the load of the wire itself adds up, so conventional systems are not suited when using very long speaker wires. You may not have never heard of 70 volt (or 70V) systems, as they are usually associated with commercial buildings. (We use 70V in North America, but other regions of the world use 100V.) Don’t worry, as they don’t need to sound tinny like in a big box store. You can get great sounding 70V speaker systems – many restaurants and bars use 70V systems. The physics of higher voltages means that long speaker wires are much less of an issue at 70V, so you can run very long wires if needed. 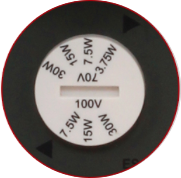 The 70V is stepped down to regular speaker voltage by the speaker, and on most 70V speakers, you can choose the wattage. By setting the wattage, you set the relative volume at each speaker to manage how loud each is throughout your yard. You also need to be aware of overloading a 70V amplifier; its calculated by adding up all your speaker wattage settings and then adding 20% for good measure. throughout your space, so all locations get the full music. 70V systems are usually mono, so you don’t need worry about lefts and rights. Both systems have various speaker styles: in-ceiling, box, faux rocks, etc, and they even have sub woofers if you need more bass in you life. Sound diffuses easy outdoors with even the wind changing performance, so its difficult to get precise sound outdoors. That said, either system will provide great background music. The cost and complexity breakpoint for implementing a 70V system is when you want many speakers, e.g. 5 or more, and/or have a large space that requires long speaker wire runs. Once you have decided on your outdoor speaker system, you just connect music regular music sources like Sonos players to get ready for outdoor tunes. We’ve talked about the different options for improving TV sound which includes a sound bar (or “soundbar”). Unfortunately the term can mean different things. Usually when someone talks about a sound bar for a TV, they mean a device that has speakers and an amplifier built together in ‘bar’. 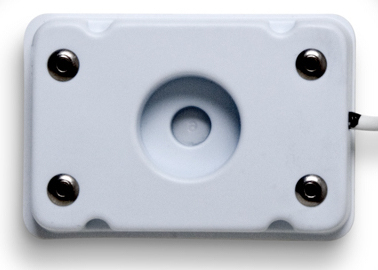 The device is designed to mount below a wall-mounted TV or sit at the base of a TV. Either way, its meant to improve the sound experience without greatly impacting your living space. 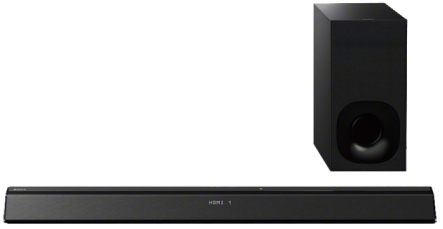 Sound bars like the ones from Sony or Samsung may also include a wired or wireless sub woofer to improve low frequency sounds. They can cost anywhere from a couple hundred dollars to thousands depending on how good they are at emulating a full sounding, surround sound experience. This probably makes sense to most people so far, but there is a curve ball. Brands like Triad and Episode use the same term to describe a bar that looks pretty much the same, but is just speakers. You need to use a separate amplifier or AV receiver with them. These types of speaker bars have one, two or three speakers built in depending on the model and need. 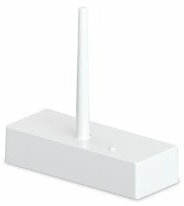 You might think that these are inferior, but they are just another way of improving a media room’s sound. Often these are used as an alternative in higher-end solutions where larger front speakers would impact aesthetics. For example, a sound bar with three speakers can be used for the front left, centre and front right in a true surround-sound system. Then other speakers, such as ceiling speakers, can make up the side or back speakers to make a great surround-sound system. Its just too bad that they don’t use a different term – perhaps something like “speaker bar” – to at least help differentiate these. Either type can be the right solution depending on goals and budgets. The first type may fit for lower budgets or limited space, but the trade off is not a true surround sound. The second type requires a bit more budget and space for other equipment (e.g. AV amplifier, speakers, etc. ), and the benefit is improved sound. Hopefully this helps clear up some confusion and gives some ideas on what might work for your media room. One of the top questions that comes up when someone is building or renovating is about the wiring they need for home tech. As much as Cat 6 is relied on for a lot of home tech, other ‘low voltage’ wires are important as well. 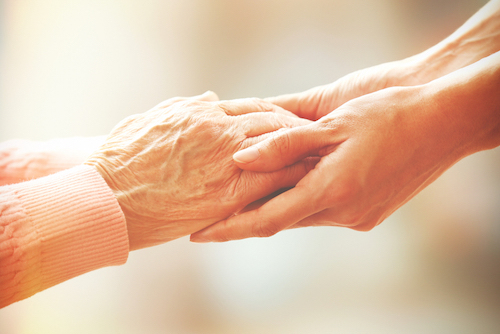 Make sure you understand and have a plan for your needs, as you shouldn’t leave it to chance that the right wiring is in place before the walls are closed up. 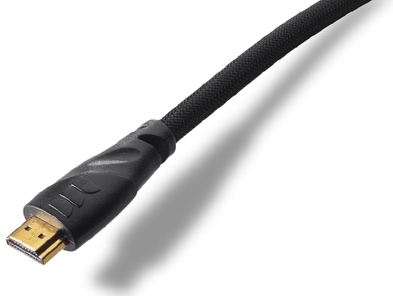 As outlined when clearing up some 4K jargon confusion, HDMI is the cable used to connect video components together – i.e. Apple TVs and Blu-ray players to AV receivers and TVs. 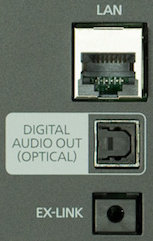 It carries both video and audio information, so all you need is one cable for both the video and sound. Although there are converters and technologies like HDBaseT to leverage Cat 6 in place of HDMI cables, at this time its usually easiest and cheapest to use an HDMI cable. If you want to mount your TV and hide the wiring in the wall, you’ll need to get an in-wall HDMI cable between your TV and your AV receivers and players. To ensure your cable is ready for the next generation of UHDTVs, make sure its HDMI 2.2 compatible. For shorter cables this is less of an issue, but longer cables could have troubles getting all the required data to a 4K TV. Speaker wire is essential for anyone looking for integrated music or home theatre sound. Although wireless music systems are great in certain situations, you can’t beat the reliability of a wire. Solutions like Sonos have made their name as a wireless solution, but they also have great products that work with wired speakers. There are lots of opinions on speaker gauge (thickness) required for speaker impedance and sound quality (e.g. 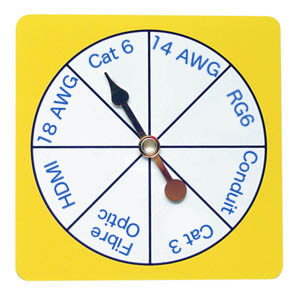 Google “speaker wire gauge distance”), but we recommend 14 gauge for most applications with standard 8 ohm speakers. Speaker wire is denoted by gauge (AWG – American Wire Gauge) and number of wires – for one speaker you would use 14/2 speaker wire. For runs to stereo speakers and volume controls, you can use four conductor or 14/4 speaker wire. Coax RG-6 cable is still used by cable TV, satellite TV and over-the-air TV antennas. Even if you’re not currently using a system that needs coax cable, it doesn’t hurt to run it to your AV locations in case you change your mind on your TV service. (This assumes we all don’t permanently become cord cutters though!) 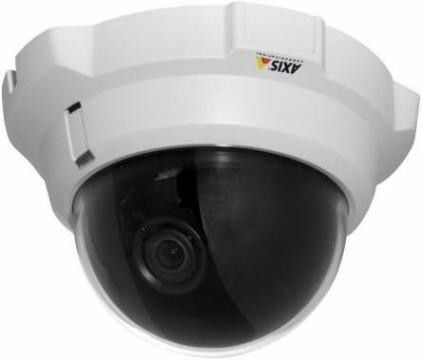 Coax RG-6, as well as RG-59 which is similar, is also used for some older surveillance cameras. For similar legacy reasons, you may want to have wiring for a landline phone system too. The good news is that instead of using telephone specific Cat 3, Cat 6 cable can be used as landline phone cable. This way it is flexible for other uses besides just home phone. 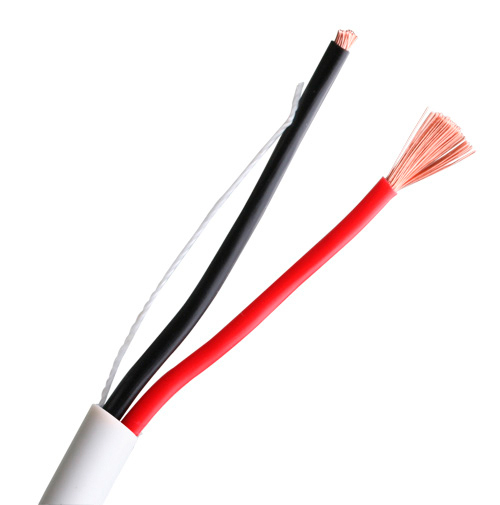 There are other low voltage wires that you may also need. For example, most smart thermostats still need thermostat wiring to turn your heating system on/off. 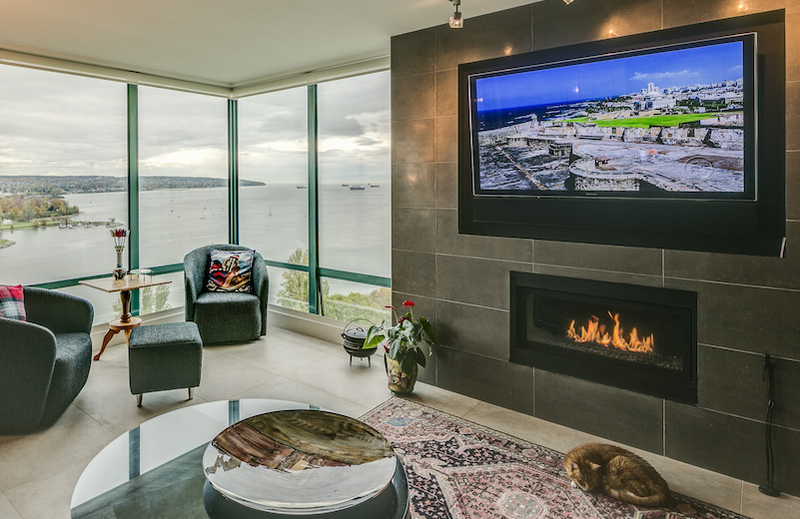 Home automation and control systems like Lutron and RTI also use similar wiring between its controllers. Higher end video distribution systems use fibre optic cabling as well. If you’re thinking about these home automation and video distribution systems, you are best served by seeking professional help to plan these. Regardless of the cables or wire that you require, they must all meet local building codes to be used in walls and in ceilings. Also ensure proper installation with separation from power wires to avoid getting electrical noise spreading to low voltage wires. Its also best to use quality wiring from known manufacturers, as it shouldn’t add much cost vs. having to re-run or fix bad wiring after walls are finished and painted! We’re also big fans of using conduits when possible, as this allows you to easily pull a new cable when required in the future (for example, a new HDMI spec). Take your time and plan out your wiring needs, and as always, reach out if you need help. Manufacturers have their idea of the smart home of the future and all the cool things they can sell us, but like anything else, its the things that fill a need that are successful. While not everyone needs a smart lock, for those with kids or visitors coming and going or have trouble finding their keys, it can be pretty handy. 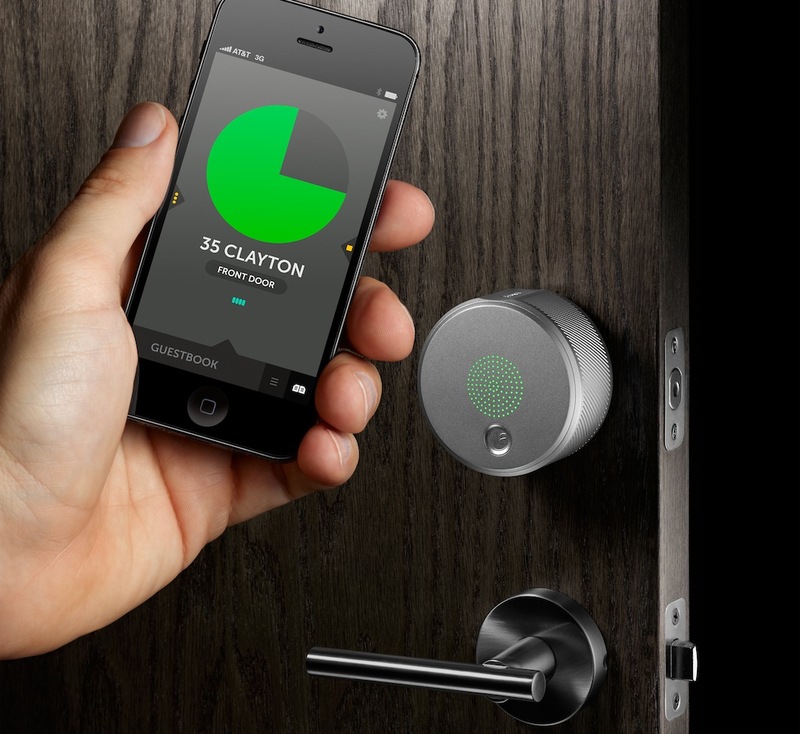 If you think a smart lock would simplify your life, then here are some points to keep in mind. First consider how the lock gets locked and unlocked. Some, like Weiser’s Kevo use your smartphone’s Bluetooth to verify its ok to unlock the door. You can send your family or visitors eKeys with optional restricted access times that you can also disable. The August Lock and Goji Smart Lock add Wi-Fi, so you can use it over the Internet to lock or unlock your door from anywhere in the world. 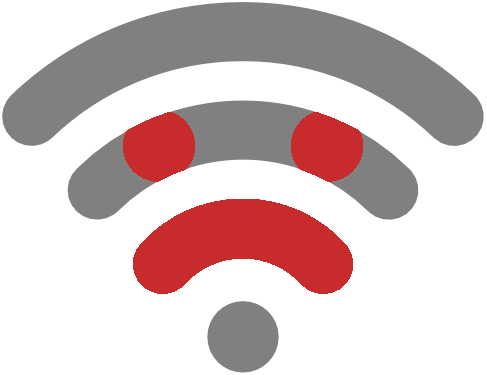 Note though that Wi-Fi compatible products work ok when your Wi-Fi coverage is good, but Wi-Fi is not known as a mission critical technology. If you want to see who’s at your door, consider one like the Goji that includes a camera. 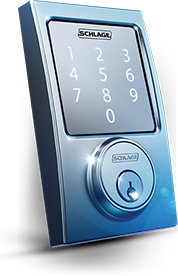 Companies like Schlage have locks that use a touch pad that allow you to program number codes. 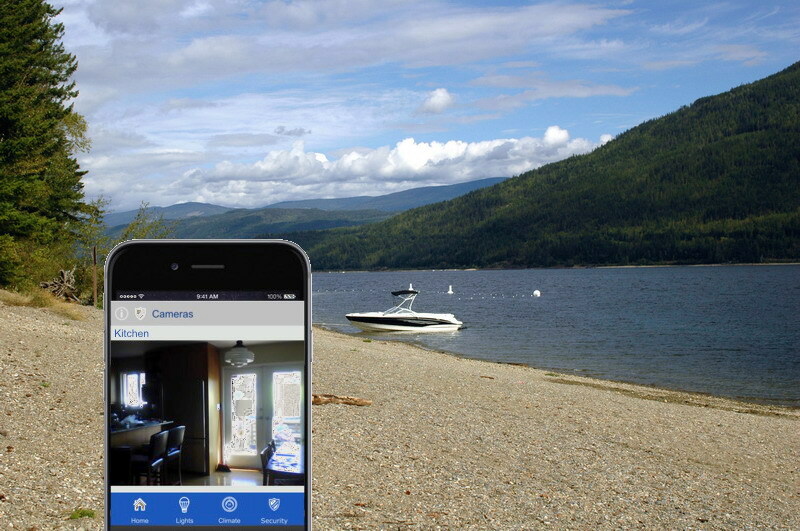 The Schlage Connect can also talk to your smart home using Z-Wave. Z-Wave is a wireless technology designed for home automation, but you’ll likely need professional help to get a true smart home experience. 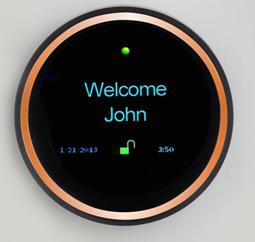 Same goes for smart locks that use ZigBee (a competing technology). Smart locks come in common lock finishes like brass and sliver to match your style and decor, and some like the August will be available in colours like grey and red. Most replace an existing deadbolt in 10 minutes or less, and they don’t need electrical re-work as they use batteries. Physical appearance on the inside and outside of the door depend on features and style. Note though that the ones with a unlocking motor will be much louder than a regular deadbolt. And yes, for the less techy, they all also allow unlocking with a regular key. 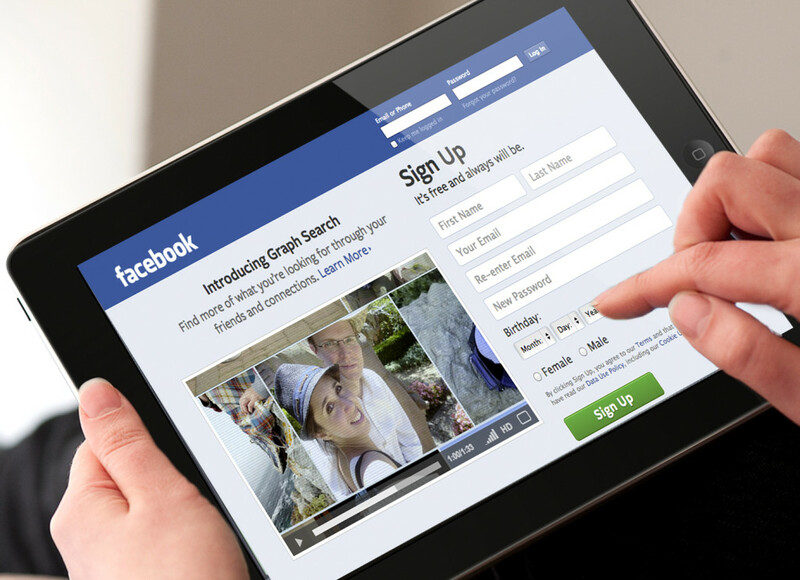 For people looking to step into the keyless era, we start by reviewing needs and use patterns. Think about what features will make your life easier and what features may be cool but maybe aren’t that useful in your real life situations. Aesthetics are important too, so consider how it will look on your door. Once you have made your smart lock choice and start using it, you’ll find your home a little smarter and more convenient.